Chris Anderson wrote a really influential book some years ago called “The Long Tail” that shaped how many people think about emerging Internet markets. If you haven’t read it you should consider adding it to you library. It was especially influential in my mind in thinking about media. 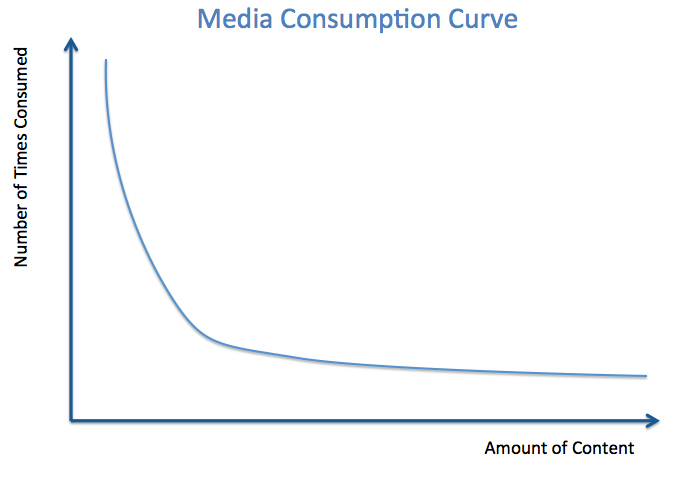 At the simplest level you can think about markets in terms of the number of times media is consumed and/or purchased by people plotted against the total number of content of that media type that is available. 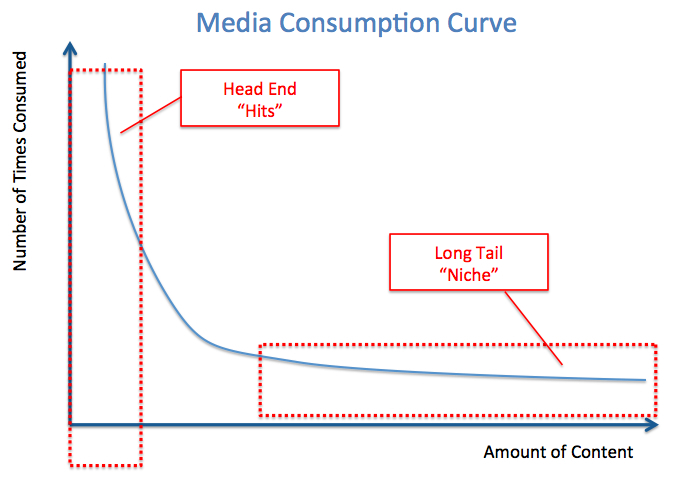 At the left of the graph is the “head end” of the market, where the “hits” are produced for mass audiences. This was how companies who produced media became big before the Internet. When you have limited distribution, the costs of distributing media are so prohibitive that only the largest of media producers (and distributors) are relevant. The book profiles markets like those for books. When you had physical stores selling books, the bookseller would have to stock the shelves with those books most likely to sell so consumer choice was more limited. It was by definition a hits-driven business. This changed with Amazon because you could stock books in warehouses and ship them when ordered greatly reducing the costs of housing books and thus you could stock a much greater variety. Now as an author you can actually publish and be able to sell only a thousand books. Even a hundred. That couldn’t happen without the advent of lower cost production & distribution. And as we know the book industry is moving fully electronic with the advent of the Kindle making the costs of production & distribution nearly zero. Think about music as another example. In the early days of music you had to produce records, which was expensive. You had to promote them via music venues by playing across the country to get your albums purchased. And with the rise of radio you then had to get airplay on radios to promote your music (leading to payola). If audiences liked your music then you had to sell them physically at Tower Records or similar. That was the only way. And you would promote your music through expensive and limited media channels (radio, who had a strangle hold on market) and retail shops (who could control placement and promotion). In the “head end” market you can make a lot of money if you’re a content producer. Mostly everybody else languishes. You also can make a lot of money if you’re a distributor to head-end markets, mostly these are monopolies, oligopolies or sometimes even mafia run businesses (for a great book on the emergence of these businesses read Lew Wasserman, The Last Mogul. Sadly, no Kindle edition). In the “long tail” you can become enormously valuable if you’re a platform. Less so if you’re a content producer. It seems appealing at first since you can “ring the cash register quickly” and it feels good. But as every blogger, musician, novelist or YouTube emerging talent knows … it doesn’t add up to much unless you go big time. TV was the same. You first had broadcast TV through local terrestrial broadcasting towers. The spectrum was so limited that as a child of the 1970’s we only got 4 TV stations. There were no physical forms to store the media – VHS, DVDs then DVRs have obviously changed this. Distribution strangleholds have dramatically decreased with cable & satellite (and now fiber) but distribution until recently has been very limited. And then there’s film. It has been expensive to produce film on celluloid reels and then these had to physically be shipped to theaters (which were also, obviously, limited). When you think about “time windows” of film distribution you literally need to think about the fact that you would open a film in the US and later ship the physical reels to London then Europe to open overseas. Physical limitations on both production AND distribution produced the hits driven business that many people associate with the media industry: Film, TV & Music. We all know what happened with music when production costs went down (ProTools) and distribution costs went to zero (Napster). It had the effect of greatly reducing the industry size but also of allowing some less known artists to reach audiences that previously would be unthinkable due to cost constraints. To some extent this lowering of production & distribution costs has been part of the YouTube phenomenon and more broadly of UGC (user-generated content) itself. YouTube has done a phenomenal job in aggregating audiences, which is why I have taken to calling YouTube the new Comcast and believe it will be a huge disruptor in the TV market . To give you a sense of scale: 800 million people visit YouTube.com every month. 4 billion videos are watched daily. In 2011 YouTube had 1 trillion views, which is the equivalent of every human watching 140 videos. Put simply: YouTube OWNS the long tail. They own the audience and that is enormous asset to leverage, but more on that in a moment. 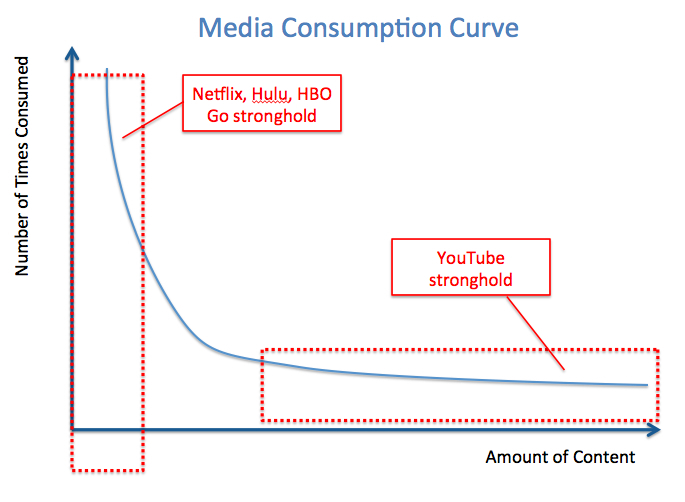 Netflix, Hulu & HBO Go are coming from the opposite direction – the Head End. Yes, it’s true that their deep libraries are virtual and therefore fit the long-tail properties. But their core asset (other than great tech & management) has been exclusive windowing of premium content that people want to consume. That is why Hulu has invested so much in building its Hulu Plus subscription service. With what is rumored to be around 2 million consumers paying $8 / month that is now a $200 million per year not including their ad revenue business. Very smart people are running these online video businesses and they know that they need to diversify by either creating or sponsoring the development of new content. Hulu announced $500 million to fund new content and Netflix has, for example, resurrected the hit / cult show Arrested Development. Interestingly Netflix plans to release the entire season all at once. Take that traditional time windows! So to some extent I believe it will be a race in video will eventually be to the middle. The Torso. I know the big players still think of the next mega hit. But the fact that Netflix focused on Arrested Development tells me they are likely thinking more like me. And I believe the torso is much more valuable than people perceive because it is growing rapidly with globalization and with the breakdown of physical distribution barriers. 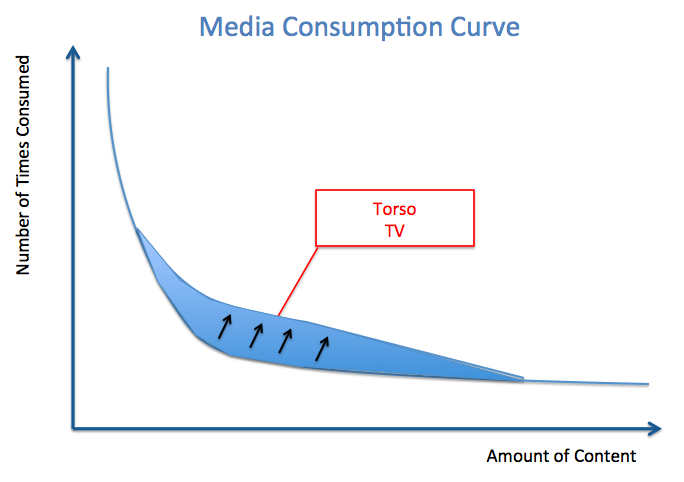 Several years ago I became fascinated in the “torso” part of the media market. I became more aware of it by my friends at Viki. The company started out in South Korea by making South Korean drama available on the Internet. I have to admit I couldn’t have named a single SK drama so the team pointed me at the popularity of the show “Boys Over Flowers” in the US. Who knew? Viki had come up with a concept of loading drama shows onto their website and built tools for “fan-subbers” to translate the show into other languages. At the time (several years ago) they were translating a 30-minute drama to something like 20 languages in less than 48 hours. Turns our there are armies of people who enjoy building status amongst their friends by translating shows better / faster. At first this was hard to believe – that thousands of people engaged in translation as a sport / for fun. But then thinking about Wikipedia, Yelp and other UGC sites I realized that people build a sense of community through knowledge and accomplishments with like-minded people online. Hard for most older (non digital native) people to understand. A bit easier of a leap for bloggers, Tweeters, Quora contributors. And these are just the obvious ones I know about. I’m sure there are dozens of very large niches of content types that are particular to parts of the world that have developed followings in other parts. You learn this in particular when you get involved with YouTube networks and find out that much of your traffic is coming from international sources – even when your videos haven’t been subtitled or dubbed. In fact, 70% of YouTube’s audience is non US and this is mirrored in most of the big YouTube networks. But as you can tell from the graph above, I believe that total consumption of these torso shows will go up as well as the total number of these shows being created will increase – creating a much bigger market opportunity. 1. Production costs have plummeted. You can produce very high quality & compelling video for around $500 / minute versus more than $50,000 / minute for network television. 2. Distribution limitations (and thus time windows & geographic windows) are disappearing. You no longer need local broadcasters, cable companies, DVDs sold in retail shops. 3. People are developing global tastes. The freeing up of media itself is leading people to discover new content forms that they couldn’t have even realized existed before. 4. Translation is getting better. It’s clear that global audiences will consume English. For now. Innovations such as Viki are getting better at delivering sub-titled shows. 5. Revenue models are emerging. With Google building global sales forces that will over the next few years be capable of selling brand advertising in many countries around the world it will become economically viable for content producers to dub their shows from day 1. Many content producers I’m speaking with are already building this into their models. Content types such as children shows, animation, cooking & fashion are easy genre to dub. There will always be big-budget, big-bet production and as a consumer I love this. But it’s not sustainable for most content production and it’s not economically rewarding for most creative content producers. So I believe it’s a race to the middle and the beneficiaries will be citizens that will increasingly have access to the world’s best content at increasingly cheaper prices due to deflationary economics. And this time the winners won’t just be the platforms – I see great opportunities for torso content producers.